Bumper stickers have remained a very popular form of advertising over the years. When a product has been around for so long, improvement is never-ending. Our company is giving you the chance to order a high quality personalized bumper sticker at a low cost. Give your customers something they will want to display on their vehicles instead of something that is boring and doesn't’t look that great. Custom 4 color process bumper stickers are created by taking your own design and screen-print it on pressure-sensitive white vinyl. Our company uses the highest quality vinyl and can be applied to the surface with its strong adhesive, but still allows easy removal in the first 6 months of application. 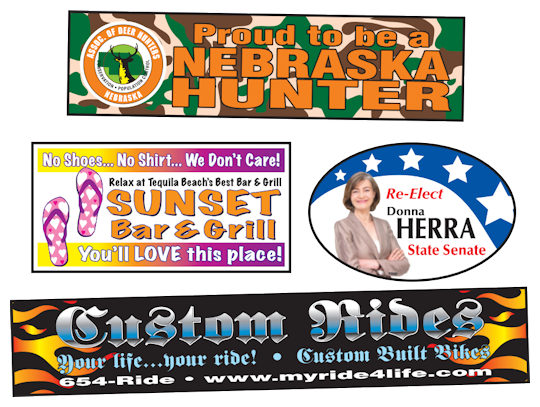 Check out our Spring Sale for savings on Full Color Bumper Stickers and Custom Bumper Stickers in the following link. BBB Member since 2004 with a proven record of complaint free customer satisfaction on items like Full Color Bumper Stickers and Custom Bumper Stickers. Click on the BBB logo above to check our record or leave a customer review. At deSIGNerySigns.com we have more than 24 years experience in designs for our Custom Bumper Stickers. Call us today and let our design specialists help create your next project to promote your product or business. FREE Shipping on all decal and sticker products | Free layout | A+ BBB rating | 24 years in the business | Call Today for a free quote on Custom Bumper Stickers. Bumper stickers can be used by any company for any reason. Custom printed bumper stickers can be used by large or small companies, profit or non-profit, store or internet. Since the vinyl bumper stickers are completely custom, they are able to be used for anything. Schools, churches, car dealerships, recreation centers, libraries, real estate companies, handy man services, festival announcements, and many more! The options are endless and the ideas are yours. Why use 4 color process? 4 color process creates vibrant colors and is essential when it comes to printing photographs or very detailed artwork. By using 4 color process, many more effects are able to be created; faded colors, color over colors, and creating detailed pictures with scenery and people. 4 color process brings images to life and catches more attention. Custom bumper stickers are used to help promote new businesses or to announce up coming events at churches and schools. They are also used for political reasons to show your support for your choice political runner. Show your support to our troops, law enforcement and justice system by handing out these bumper stickers at town meetings, during seminars, and on voting days. Custom full color bumper stickers are sure to catch public attention. With endless color possibilities and detailed pictures, these bumper stickers are sure to bring your company more business. Hand them out as promotion announcements, or to let your clients know you care. If you are not sure that these bumper stickers are right for you, let us know! We will send you some free samples so you can see the quality of the sticker and see how well it will work for you. Visit us on our Contact Us page and fill out the simple free bumper sticker samples request form. If you have an idea and would like to know the cost on your next bumper sticker project, let us know by filling out the free quote request form. Our company not only provides quality products, but also quality customer service. Contact us today to get your next bumper sticker project going!